The redness and swelling of viral, environmental, or allergic conjunctivitis can really disrupt your day. Similasan’s Pink Eye Relief sterile eye drops are specifically formulated to address those symptoms associated with viral or environmental conjunctivitis, along with sensation of grittiness, watery discharge, burning, and redness of the inner eyelids. Because the active ingredients are homeopathic, Pink Eye Relief is safe to use all day. Pink Eye Relief does not contain an antibiotic and so should not be used with bacterial conjunctivitis and/or if you are experiencing a thick discharge that is white, yellow or green and may glue the eye shut- you should see your doctor. 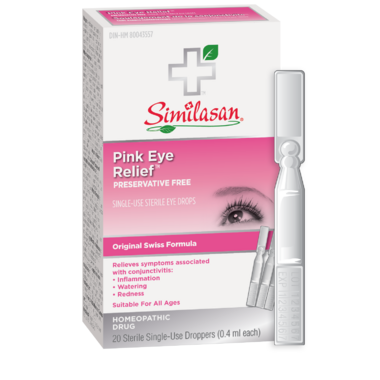 Help your eyes to feel better with Similasan’s Pink Eye Relief sterile eye drops, so you can get back to your day. Uses: According to homeopathic principles, the medicinal ingredients in this medication temporarily relieve minor symptoms associated with viral and environmental conjunctivitis, such as: inflammation and redness of the whites of the eyes and inner eyelids; excessive watery (clear) discharge; sensation of grittiness; and sensitivity to light. Directions: Adults and children age 12 and over: Apply 2-3 drops, 3 times per day. Children 1-11 years: Apply 1-2 drops, 3 times per day. Children 0-11 months: Apply 1 drop, 2 times per day. Acute dosing: 1 drop in the affected eye every 15 minutes for a maximum of 3 hours. Remove a single-use dropper. Twist flat end with ball to remove. Squeeze plastic dropper to release 2-3 drops into eye and discard applicator. Apply as needed throughout the day or night. Use a new dropper for every application. Warnings: For external use only. While this product is suitable for all ages, children with conjunctivitis should be seen by a doctor. Initial exacerbation of symptoms may occur. Use only if dropper seal is intact. To avoid contamination, do not touch the tip of the container to any surface. Do not reuse. Once opened, discard. Contact wearers: consult a physician prior to using. Do not use: if you are experiencing a thick, white, yellow or green discharge that forms a crust on the eyelid; if the solution changes colour or becomes cloudy; if you experience eye pain or change in vision; if you frequently contract infections that don't cleay up quickly. Stop use and ask a doctor if: Symptoms worsen or persist for more than 72 hours, changes in vision occur or you experience eye pain, or if you might have a serious underlying medical cause for the condition. Can't comment on the other rating and active ingredients however I have found this product very helpful in treating dry irritated eyes. I am a contact lens user and during colder weather gritty, itchy eyes increase at times. Using this product for a few days seems to clears up the irritation quickly. After investigating what the 6X & 12X designations after the active ingredients means, I learned there is no active ingredient in this product whatsoever. Do not use. This is a scam and should not be sold. This is probably why it can only be shipped to Canadians.